With rhythmic, steady steps, uninterrupted and in continuous circle, the dance initiating the long-lived traditional Fiesta del Kiribá y Nengón, alive since more than a century, reveals the primary cells of the Cuban son. Exuding Caribbean soul, the couples (many related) taking part in the continuous dance preserve their culture the way they know best: dancing the ancestral steps. 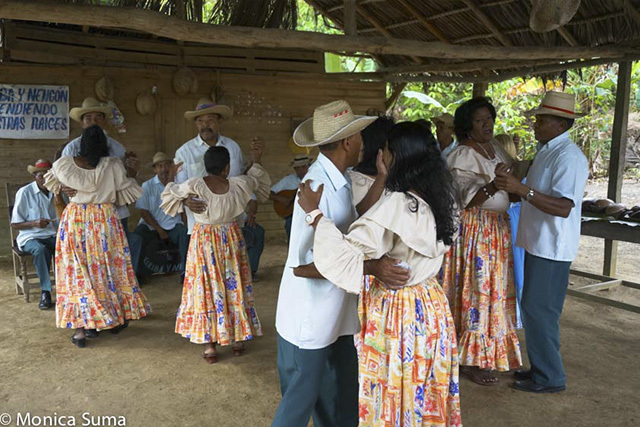 Under the Defendiendo nuestro raices adage (“safeguarding our traditions”), Baracoa’s El Güirito community—Cuba’s oldest and most remote settlement—bears witness to the birth, growth, and continuity of a century-old musical-dancing tradition. 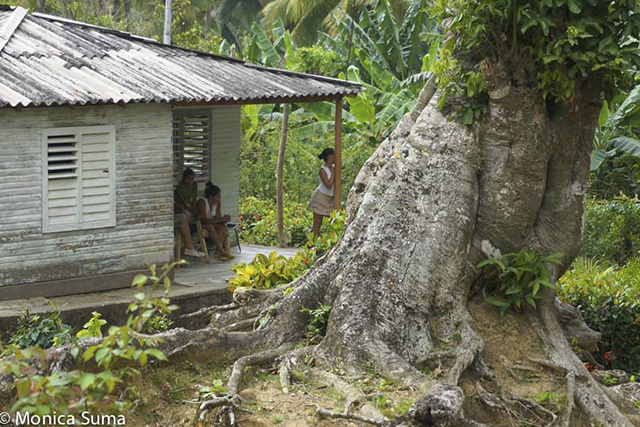 Here, amid lush forests laden with coffee and cocoa beans, people live simply, in tune with nature and traditions passed from generation to generation. Neither el Kiribá nor el Nengón is a variant of Cuban son, precursor of today’s salsa music, notes Teresa Roche, leader of a group named for the dance: Grupo Kiribá-Nengón. They are the nucleus from which el son evolved. Directly linked to the culture and history of Baracoa, both sounds are interpreted with the help of the marímbula, bongó, güayo, maracas, and Cuban claves. Accompanying folkloric lyrics tell stories of Baracoa, the Taíno capital of Cuba, once home to Indians inhabiting the region. A central figure in revitalizing the Baracoa-based celebration, extinct only decades ago, Roche saw it breathe new life in 1984. Thirty years later, the rustic setting for the Kiribá-Nengón performances hosts guests eager to witness a rarely-seen side of Cuba’s culture, far in the Guantanamo province. What traditionally lasted three or four days now lasts for a full two. The ceremony still bewilders visitors unaccustomed to Baracoa’s rhythm. After the dancing, comes the food. The misleading surroundings—chickens running amok beside humble wooden barracks, century-old trees safeguarding the improvised dance floor— speak little of the feast to follow. True to Cuba’s reputation for warmth and hospitality, a succulent, handsome assortment of typical Baracoense dishes—roasted pork, tetí (a local fish), bacanes (a boiled mix of bananas and pork, wrapped in banana leaves), palmito (hearts of palm), beans and crab enchilado with coconut milk, and the famed coconut dessert cucurucho—entice and educate lucky visitors. 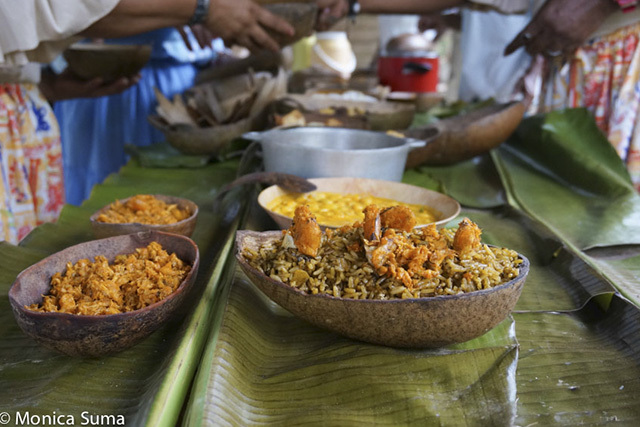 Far from the predictable rice and beans on every Cuban plate, this tropical forest-surrounded buffet is among the best—and most authentic—in Cuba. 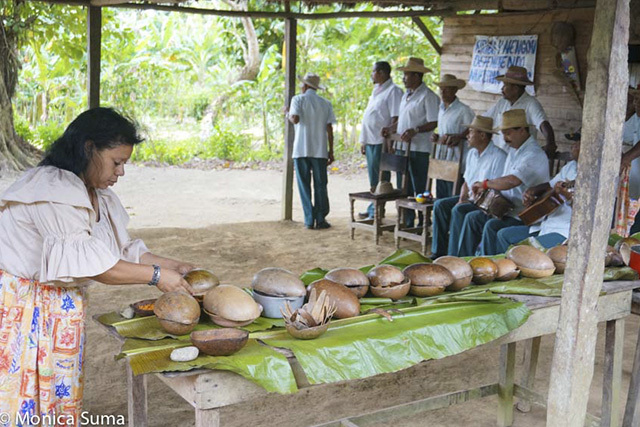 The ecological preparation and serving—in natural bowls not unlike the abundant coconuts gracing the region—underscores the locals’ harmonious relationship with their environment. Meanwhile, the dance continues. The steps, much more structured than today’s salsa, can feel repetitive and hard to follow. Recognized for its quicker pace, danced in pairs forward and backward, the Kiribá is the looser of the two. Associated with peasants’ work, simulating the heaping of the coffee crops of the region with their feet, the Nengón, also danced in pairs, counts on slower, lingering steps: right foot forward, rounded inwards, left foot forward, rounded inwards. 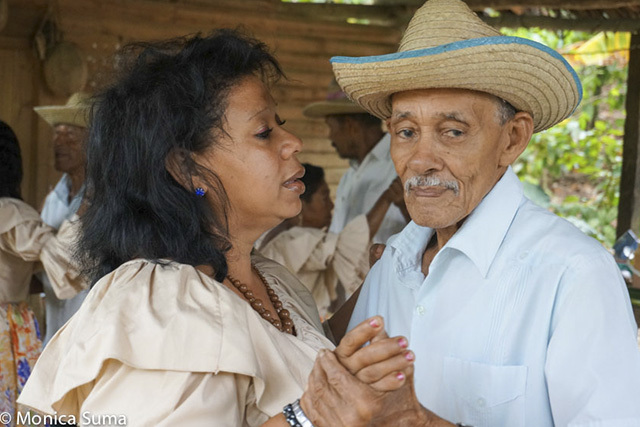 Men typically wear guayabera shirts, green pants, and traditional straw hats as they lead their female partners, decked in beige blouses with flounces, long flowered skirts, and black heels. Whether the dance continues or not, it’s decided by a simple sign during the Nengón. If a dancer or guest takes his hat off, the fiesta continues. Whether it ever comes to a stop, that’s always decided by the Kiribá. 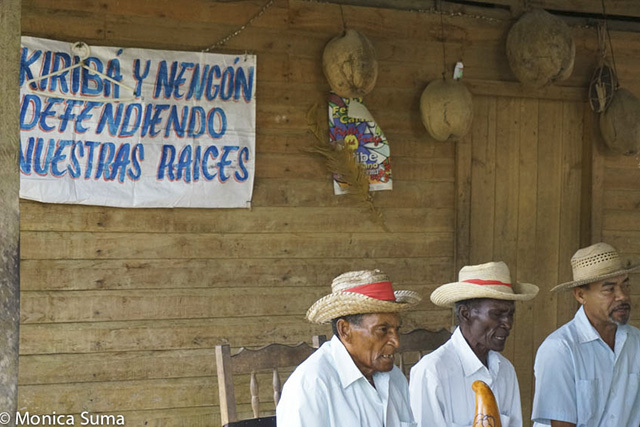 Join us on Undiscovered Cuba for a unique chance to witness the Fiesta Kiribá y Nengón. Text by Monica Suma. You can follow her on Twitter @MonicaSuma.